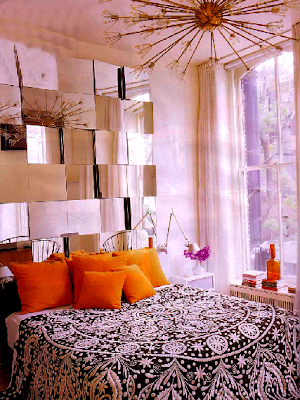 6 Responses to "USING YOUR WALLS: Mirrored headboard"
hello! found your blog thru apartment therapy and now i'm hooked! i looove this headboard btw! Very interesting idea. Who wants a simple headboard anyway. HI! Can you tell me where you got the funky chandelier from? Make/model? Thanks! My daughter is trying to copy your headboard idea. Ikea has the mirrored tiles. I suggested gluing the mirrored tiles to shims (triangular blocks) on a frame that was screwed into the wall studs. Do you mind sharing how you did it? Saw this headboard in top design and i'm desperately trying to make this headboard but am a beginner - any suggestions where or how to start? ?